At Savannah Court of the Palm Beaches, we believe everything in life has a season. As children, we thrive on the love, care, and protection our parents provide us with. Then, as the seasons change, role reversals--due to the aging processes or Alzheimer's or dementia--may occur. Suddenly, you’re entrusted with providing your loved one the same gift of compassionate, dignified care you were provided years ago. Unfortunately, making the decisions regarding your parent’s care can be both challenging and overwhelming. That is why we are here--to provide families with a safe, warm, and homelike living option for loved ones who need specialized memory care services and to guide you through the entire process. Our Savannah Cottage is a secured memory support residence located within Savannah Court of the Palm Beaches. While it’s located in our main community, it offers the safety, security, and privacy that is essential for memory care residents. We understand that a person with Alzheimer's disease or dementia has the same basic needs as all other residents: love, understanding, security, and a sense of dignity. Wander through Savannah Cottage, and you might just see a team member baking a cake, cooking a meal, folding laundry, or playing a game with a group of our residents. Tour our cozy cottage apartments (which house both private and semiprivate apartments) and take note on how our community is designed to enable residents to live as independently as possible, while being carefully monitored for safety. Come tour our community and see how you can give your family member the care he/she deserves. Schedule your visit today. All of our Alzheimer’s and dementia care patients have unique needs. For this reason, our West Palm Beach memory care community provides a variety of services to help your loved one live life to the fullest. And we only charge you for what your loved one truly needs so you won’t ever pay for something that your family member doesn’t need. Before moving into Savannah Cottage, new residents are assessed to determine which care services they need. From there, our team will put together a plan that will ensure your family member gets the best care possible. 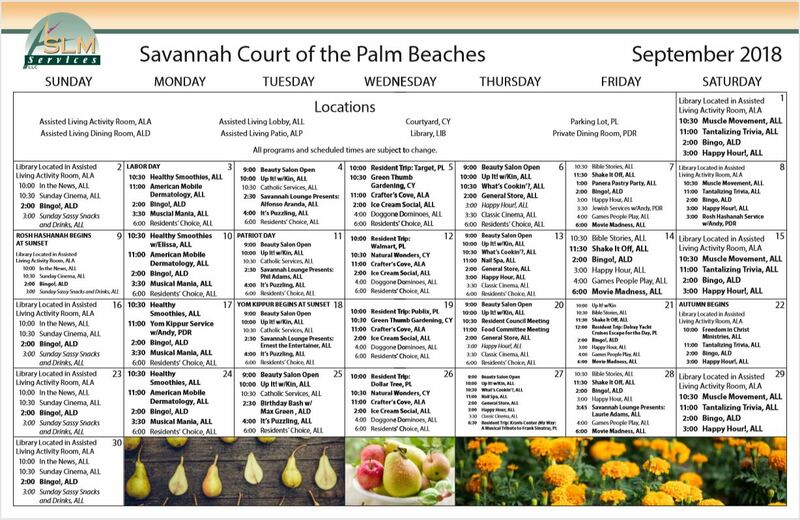 Our memory care residents are encouraged to participate in regular activities at Savannah Court of the Palm Beaches. View our calendar to see what’s happening this week.